Purchasing a new construction home is usually more complicated and intimidating than buying a pre-owned home. As a real estate agent who specializes in new construction, buyers ask all the time if they can use a real estate agent when they are purchasing a new home. The answer is yes! Your Real Estate Agent who understands the ins and outs of home purchasing, can work on your behalf to negotiate a better deal, free upgrades, or simply whatever is in your best interest. Without proper guidance, you could easily spend a lot of money on upgrading items in your new home that really don’t bring more value when it comes time to sell. Builders’ model homes are usually staffed by agents who work directly for and represent the builder. You may not realize that the builder is not required to have a licensed agent working for them, and many do not. A real estate agent who also has experience working with builders from the ground up can often be great consultants for making small modifications to a plan. I can’t tell you the number of times we have changed a builders standard plan into something that works better for our clients. Experience isn’t expensive. It’s priceless. Your real estate agent is just as important on new construction home purchases as on a resale purchase. However, not just any real estate agent is qualified to be the right agent to help you with your new home purchase. Make sure that you are working with an agent who is not only very familiar with the specific area, but also with the construction process…even if you are looking to purchase a completed inventory home. The Christi Cooke Real Estate Team has 20 plus years in new home construction. Most builders will use their own contracts and forms (instead of the promulgated forms typically used for pre-owned homes), so it is also important that your agent also has adequate knowledge to assist you in fully understanding all of the terms (not just the terms that the on-site sales rep wants to explain to you). We can help you review any contracts you sign to make sure you are protected and that you are getting what you think you have agreed upon. The right agent can help you make educated decisions regarding your lot choice and structural options, if building from the ground up, and provide you with information on what is best suited for resaleability in the area. Builder sales reps are not qualified to advise on resale value. The best value in real estate is not always clear without extensive experience to guide you. While you can just go with your gut, working with your Real Estate Agent can help ensure you make choices about your purchase that will best serve your interest. Once you have decided on a community and floor plan, the right real estate agent can help you negotiate. They will be able to provide you with information on pricing & incentives that are currently being offered by other builders at competing properties as well as pricing and information on comparable existing homes in the area. Basically, you will be armed with the information that the builder and builder’s sales rep would prefer you didn’t have! The right agent will also help with your financing, whether you are using the builder’s preferred lender or an outside lender. If you decide to build a home from the ground-up or if you choose a home that is still under construction, your agent can assist you with construction meetings and “walk-thrus” throughout the completion of your new home. Even if you choose a completed home, your agent can assist with the final walk-thru and home orientation. During these meetings with the construction superintendents or managers, it can be very helpful to have an extra set of eyes and ears and to have someone who can help put the construction lingo into dialog that makes more sense. Again, it is extremely important that your agent is very familiar with new construction homes. New construction homes typically have to pass several inspections throughout the building process. However, it is still advised that you hire your own 3rd party inspector. The right agent will be able to refer you to several trusted inspection companies and will address items found by the inspector with the builder before closing. Closing…this is definitely another reason you will greatly benefit from having a qualified real estate agent by your side. You wouldn’t want to go to closing for a pre-owned home without your trusted agent, so why would you close on a new home without one? With all of the paperwork, closing disclosures, signatures and money changing hands, you shouldn’t go it alone! So, even though you may be told that you do not need an agent when purchasing a new construction home, you really should have your own representation. Would you go to court if the other side had an attorney and you didn’t… and the other side’s attorney “offered” to help you? Having a real estate agent represent you, does not cost you a thing. The builder is responsible for paying the agents commission. Keep in mind that most builders will require that the real estate agent accompany and register the buyer on their first visit to the builder’s model home or community. If you “stop by” the new-home community make sure that the builder knows upfront that you have an agent. Many builders will require that your agent is listed on your initial registration. Also, make sure that your agent is involved with the contract process. Side note: Some new-home buyers think that if they do not use an agent for their purchase, the builder will reduce the price of the home by the amount of the commission. For the most part, this cannot be further from the reality. Builders do not want to reduce their prices for future home sales in that neighborhood. If a buyer goes to a new-home builder without a real estate agent, either the builder’s agent or the builder will pocket that money. 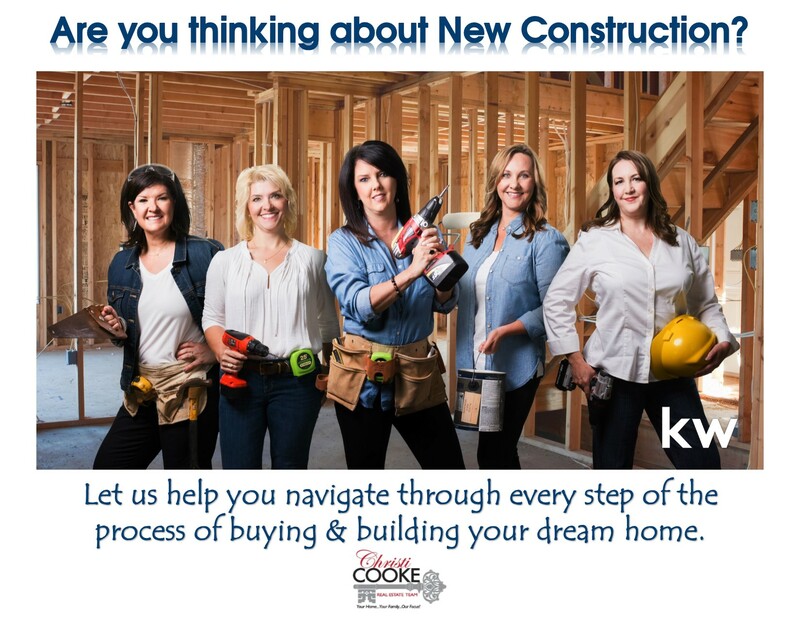 If you are currently considering purchasing a new construction home in the DFW area, and want someone who can assist you with every step of the process, we would love to help. While you can choose to work with any Real Estate Agent, having someone in your corner with experience can be a huge asset. Christi Cooke has been in the real estate industry in the DFW area for 20 plus years. She began her career as a luxury, new home builder and brings a wealth of knowledge and expertise from that industry with her. Give us a call (817)980-5970 or shoot us an email today @ christicookerealty@gmail.com.